Your Job Becomes A Breeze! Plus The Expertise To Get You Up & Running Quickly! You Can Bypass The Competition! Your One Stop Distributor For These Precision Tool Makers! HEIDENHAIN’s comprehensive product program offers solutions for all applications in which the highest possible accuracy, reliable reproduce-ability and repeat-ability, safe process management, high machine dynamics, simple operation and of course maximum efficiency are required. Length Gauges – Length gauges from HEIDENHAIN offer high accuracy over the entire measuring range, are mechanically rugged, and can be used in a great variety of applications. They have a wide range of applications in production metrology, in multipoint inspection stations, measuring equipment monitoring, and as position measuring devices. Linear Encoders – Sealed linear encoders from HEIDENHAIN are protected from dust, chips and splash fluids and are ideal for operation on machine tools. Exposed linear encoders are designed for use on machines and installations that require high accuracy of the measured value. Rotary Encoders – Rotary encoders from HEIDENHAIN serve as measuring sensors for rotary motion, angular velocity, and when used in conjunction with mechanical measuring standards such as lead screws, for linear motion. Application areas include electrical motors, machine tools, printing machines, woodworking machines, textile machines, robots and handling devices, as well as various types of measuring, testing, and inspection devices. Magnetic Modular Encoders – The robust ERM modular magnetic encoders are especially suited for use in production machines. Their large available inside diameters, their small dimensions and the compact design predestine them for the C axis of lathes, rotary and tilting axes (e.g. for speed measurement on direct drives or for integration in gear stages), spindle orientation on milling machines, or for auxiliary axes. Angle Encoders – HEIDENHAIN angle encoders are characterized by high accuracy values in the angular second range and better. These devices are used in applications such as rotary tables, swivel heads of machine tools, dividing apparatuses, high-precision angle measuring tables, precision devices in angular metrology, antennas and telescopes. Subsequent Electronics – Evaluation electronics for metrological applications from HEIDENHAIN serve to visualize and process the values measured with linear encoders, length gauges, rotary encoders or angle encoders. Digital readouts for manual machine tools increase your productivity. You save time, increase the dimensional accuracy of the finished workpiece and enjoy user-friendly operation. TNC Controls – The TNC controls from HEIDENHAIN cover the whole range of applications: From the simple, compact TNC 128 three-axis straight cut control to the TNC 640 (up to 18 axes plus spindle)—there’s a TNC control for nearly every application. They handle simple milling tasks just as reliably as high speed cutting—with especially jerk-free path control—or 5-axis machining with swivel head and rotary table. 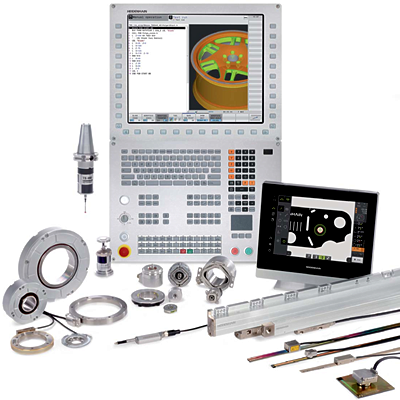 Touch Probes and Comparator Systems – The TS workpiece touch probes from HEIDENHAIN help you perform setup, measuring and inspection functions directly on the machine tool. Tool measurement on the machine shortens non-productive times, increases machining accuracy and reduces scrapping and reworking of machined parts. We have been selling, servicing and installing Heidenhain products for over 50 years. We have developed and built measuring and inspection devices for many of the world’s standards laboratories as well as angle encoders for various telescopes and satellite reception antennas. Of course, the knowledge we’ve gained in these endeavors has also flowed into the manufacture of our series products. Download our General Catalog here. Download our Accessories Catalog here. Copyright © Tech Tools, inc. All Rights Reserved.